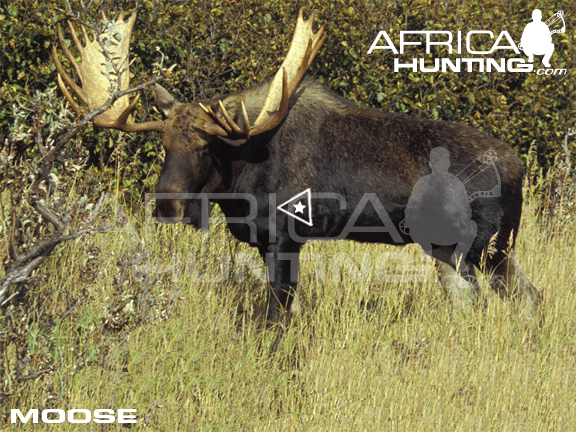 Discussion in 'Shot Placement' started by AfricaHunting.com, Oct 4, 2011. 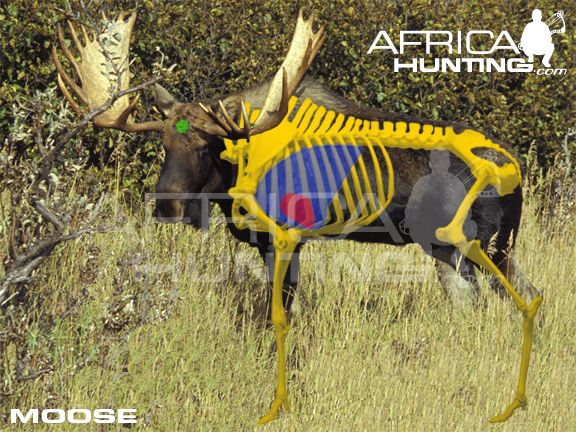 Post your questions, comments or pictures relating to bowhunting shot placement. Anyone has the right to share, copy, distribute and transmit this image/work (but not to adapt it, or use it for commercial use). Shoulder or no shoulder shot? I plan on shooting a 60# Hoyt defiant this moose season with supposedly 400 grain arrows with a 125 grain G5 montec (included in the 400 grains) if it is not ready in time i am shooting a bear attitude with the same set up. the Hoyt is pushing 64.9 ft/lbs of KE while the Bear is pushing 54.3. i have heard people say stay away from moose shoulder and others say that even the my Bear setup will crush it. Should i aim up the opposite front leg like usual and avoid the front shoulder or stay away from both in general? your setup will work fine, you want to be just on the inside of the leg, 10-12" above the brisket, gets the top of the heart and a double lung everytime, a good broadhead will get a pass thru. on a 25 yard shot, a trick I use is to put my 40 yard pin right on the brisket line, that gets my 20 yard pin at the 12" mark. with a big animal guys tend to aim mid body and can end up a bit high. aim small and pick your spot. shoot for that golden triangle and you will be perfect. on the drawing the lungs don't go that high and that shoulder blade is lower down. a buddy this fall, hit a moose in the shoulder blade and got only 7" of penetration, very, very few broadheads will go thru a moose shoulder blade. here is my shot on my bull elk this year, 9" up from the brisket, was a perfect heart shot. So just asking for a friend, where is the brisket? Let your friend know that the brisket is the lowest part of the ribcage on the animal. nuval .....Good luck and play safe ! Here is a great article: Butchering of Wild Game: http://www.africahunting.com/threads/butchering-of-wild-game.14406/. Good luck ....keep us informed !